* FCC version has 200 mWatt output power for one+ mile range (probably much more) - compare this to the very low power output of other systems on the market. * Fully compatible with all known car and truck systems - no need to replace your existing electronics. * Onboard components weigh only an ounce or two (depending on model and accessories), TOTAL. Other systems weigh much more. 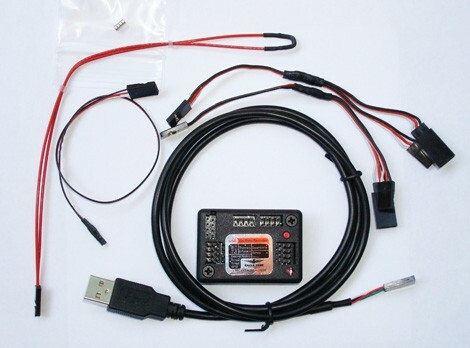 * Small self-contained LCD Telemetry receiver attaches simply to your radio, or is monitored by your pit crew. No laptop needed at field! * On-board components are powered from your receiver battery - other systems require heavy, cumbersome batteries to worry about. * 65536 unique transmission IDs (programmable) means collision problems are extremely unlikely at your site. * Fully programmable audible alerts can be set on data parameters. * Dashboard is a USB peripheral: plug the receiver into your laptop while to get full screen live display and unlimited recording on your laptop! * Ultra-light stainless whip antennas. Here's a partial list of the data that can be displayed on the Seagull Wireless Dashboard. * Servo movements: The Seagull will display positions of up to two servos, with settable user friendly names on the LCD. * Speed: The Seagull displays the speed of your model with each sample. * RPM: The Seagull displays the RPM of your model's motor. * Temperature: The Seagull displays up to two channels of temperature. * Optional Accessories: Optional expanders for measuring G-Force, Exhaust Gas Temperature, Electric Motor Current/Voltage, and other parameters are available from Eagle Tree Systems. All data from these expanders is compatible with Seagull Packages. * With accessories available below, monitor amps, pack volts, g-force, EGT, and more! * USB Plug and Play - No new drivers needed! * NEW: now has 4X the onboard memory of the original recorders, with lossless data compression, for much longer storage time.